Happy fall to one and all! Could I be any more corny? Yes fall has arrived today. I was actually out collecting leaves a little while ago to show the children tomorrow. Fall is such a wonderful time of year here. In PA the colors are beautiful and the weather is gorgeous. Some great fall activities for young children involve apples. Because apple picking time is in the fall, it's a good theme to focus on. It's amazing what one can do with an apple. First of all it's the discovery of the many different kinds of apples. Go to the store, buy different kinds and have a tasting party. They will be amazed that apples can taste so differently. Next apples can be cooked into so many different things. Throw one in the oven with some cinnamon and butter--have a baked apple. Make an apple pie, apple turnovers, apple crisp, apple cake--the list goes on and on. Since many of you already know, the kitchen is not my expertise--so my recipe box for these are empty. There are many great recipes out there on the web for apples. I just typed in easy apple recipes. One recipe involved making a baked apple in the microwave and using cinnamon candies. You can find it here: http://southernfood.about.com/od/bakedapples/r/bl40312x.htm. We used a laminator to finish off ours, but if you don't have one you can purchase clear contact paper at any store. Pour out some different color tempera paints. Cut the apple horizontally. I removed the seeds to show the children what the seeds look like and also to show them the pattern inside. 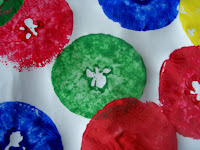 Dip the apple into a paint color, then press it on the paper. You now have a beautiful apple stamp with the star inside. (As you can see my star didn't come out that sharp--it looked good in the apple:). After the paper dries you can add your child's name if you like. Run it through a laminator or cover with contact paper and they have their own personalized placemat. I must say this is the first time I have ever done this project. It is usually done with the Pre-K children. Have a ball, mix the colors, overlap, make it your own. I meant to check my Mailbox Magazine to see if it had any unique apple ideas, but I left it at school. If I find anything I'll be sure to let you know.